First of all, sorry for the delay this week in new content. We’ve all had a busy week, and combine that with the true “dog days” of summer in the WSU football world, we thought this might be a good time to take a little rest. But the vacation is now over. With Pac-10 media day set for late next week, and previews galore hitting the ‘net, it’s time to get back at it. I have to respectfully disagree here. Returning starters are nice in the spring and summer and they fill preview pieces in every medium. But do they really mean a lot? Not necessarily. Case in point – Arizona. Last year, they returned anywhere from 17 to even 19 starters back from the 2006 season, a year in which they closed fast and finished at 6-6. Especially on defense, where they had 9 or 10 starters back on a fairly decent unit. So what happened? The Mildcats slipped, actually turning in a 5-7 record, and they had to win three of their last four to do it. Exhibit B – UCLA. An amazing 20 starters back from 2006, 10 on each side of the ball, coming off a 7-6 season in ’06. They were picked by many to be an upper-echelon team in the conference, no worse than third in many publications. What happened? Try 6-7, or one game worse than the prior year. It can go the other way too. ASU and Oregon were two of the best teams in the conference last year. And guess what? Both teams returned just 14 starters, total, from 2006, yet ASU won 10 games, Oregon won nine. Now obviously it’s not just black-n-white here. IF UCLA would have stayed healthy, sure, maybe those 20 starters would have made a difference and they could have added at least two or three wins to that total. But in Arizona’s case, they didn’t suffer nearly the rash of injuries that UCLA had to endure. Yet they still underachieved. The biggest area of concern for the conference, however, is the lack of starters returning at the most important position. That’s right, QB. USC, CAL (Riley or Longshore? ), Oregon(Costa, probably? ), Oregon State (Moevao/Canfield? ), UCLA (Olson if the foot holds up??? ), and of course, WSU with Big Gary, are all handing the reins to relatively inexperienced QB’s. I told Brinkhater the other day, I honestly cannot remember a year with so many unknown quantities at QB in this conference. And no matter the system, no matter the supporting cast, etc, green starters at the top are always a great unknown. Sure they look great in 7-on-7’s in the summer, or they had a strong spring game, or hey, they’ve even looked OK in some limited game situations last year. But being a starter at QB is a whole different deal, and there’s a brand new set of pressures that will come with the honor. You just can’t tell what is going to happen until the you-know-what hits the fan. Too many things can happen, good and bad, to base your forecast on what is going to happen in the coming season on returning starters. They might not matter nearly as much as you think. Molly Yanity of the P-I picks WSU 10th. Big surprise. She’s not alone on “Mrs. 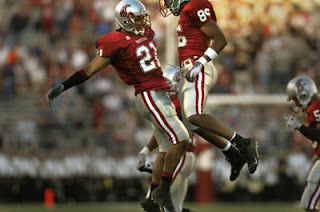 Last Island” for our Cougs, as that is about the consensus. Oh yeah, she also has UW 7th, which is about the highest that anyone in mainstream media has tagged them. Her reasoning? If they can overcome an 0 -3 start, they could surprise. The d-line and the skill positions are all young and inexperienced, but if they improve they could give a decent conference showing. And “Jake Locker is money.” OK then. I like Molly and I think she does a good job, but, you know the saying on how sometimes she might be a little too close to the tree to see the rest of the forest? Jake Locker is a fabulous athlete, and might be the top RUNNING BACK coming back in the conference this year (he is the leading rusher back from last year after all). But a 47% completion percentage, with 14 td’s and 15 INT’s on a 4-win team, well, how is that money, exactly? Factor in the loss of all those skill-position guys (leading returning receiver is TE Michael Gottleib with 12 catches??) and I’m not seeing it. Sure Locker will improve, of course he will. To suggest otherwise is crazy. But if people actually looked at the numbers, beyond the dazzling running ability and the fact that he’s just an outstanding young man, they’ll see a young QB with a ton of promise, but isn’t all the way there. Week one lines are starting to hit. WSU is a 6-point dog in Seattle vs. Okie State. I have to agree with Bob Condotta of the Times on this one, as that sounds about right. I told Brinkhater that I actually think this line will move to Okie State’s side, and we might be as much as a 7.5 or 8-pt dog when it’s all said and done. Finally, 100% off-topic – THE DARK KNIGHT is opening and the reviews are off-the-charts fantastic. Everything written and said about this movie so far is that it’s absolutely brilliant, from Ledger’s Joker to Bale’s Batman to the story itself. We touched on it when Ledger died, but you could tell from the early going that this could be a pretty amazing movie. The buzz is so great that some are predicting it could be the biggest opening weekend of all-time, and that online movie ticket places like Fandango were selling out several days in advance. If you are going to go out and try to see it this weekend, you might want to order in advance and yeah, be prepared to wait in line. But it should be worth it! That’s about it for today. We are gearing up for preview season, so stay tuned for some original content in the coming days. And as always, ENJOY YOUR FRIDAY! You are currently browsing the archives for the Pac-10 starters category.